Happy Halloween! I thought I would give the adults a treat and make something a little less spooky and a little less tooth-achingly sweet this year. These deep chocolate sables fit the bill. They are soft, with a deep chocolate flavor. There is just the right amount of sweetness to balance the darkness of the rich dark chocolate. 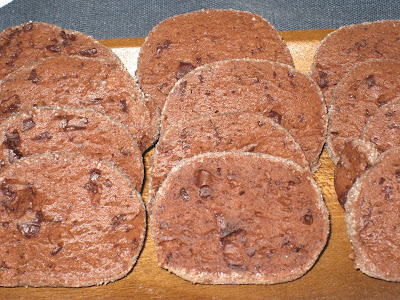 This recipe calls for finely chopped semi-sweet or bittersweet chocolate. I had just the right amount of leftover chocolate (from bars) on hand from earlier baking projects - 2 parts semisweet to 1 part bittersweet. What a perfect way to finally use them! I was afraid I was chopping it too fine, as there was quite a bit of "dust" accumulating, but there were still chunks that got in the way when I was slicing the finished logs, so I think I didn't chop it finely enough. You also want to roll the logs slightly bigger than you think you want them, because they will get smaller yet when you roll them in the sugar. And there is one thing I have learned with the most recent batches of cookies that I have made, and is the hardest thing to do: you should really wait at least overnight before tasting your baked goods. The only exception I can think of is chocolate chip cookies, of which there is nothing better than taking a bite when they are still soft and warm from the oven. Everything else needs time for the ingredients to settle down and the flavors to combine. And actually, now that I think about it, even chocolate chip cookies are better the next day. When I tried one not long after baking it (I did wait until it had cooled completely), it was ok, but not great. And I could really taste the cocoa, which left a slight bitter aftertaste. I was pretty sure I had ruined them because I did not use the Dutch-processed cocoa as specified in the recipe. I did not have any on hand and I was not going out just for that so I used regular cocoa. I did not think it would matter that much to my palate, since I had grown up with everyday American cocoa, but maybe for this recipe it really did matter. But I tried them again the next day with my morning coffee, and that slightly bitter aftertaste had mellowed, and all I tasted was rich, deep, velvety chocolate. Very good. Worth making again. Another thing I love about these cookies is that you can mix up the dough, roll out the logs, and then put them in the refrigerator for up to 3 days before you bake them. I'm sure they would freeze well, too. I love cooking in installments. Cream together the butter and confectioner's sugar until well blended. Add the cocoa powder and mix until it is also well blended. Add the eggs one at a time, making sure each one is fully blended. Beat in the vanilla and the salt. Add the flour in three installments, mixing until just blended each time. Add the chocolate and stir only as much as necessary for the mixture to come together. in it, making sure each log is well coated. Wrap in plastic and refrigerate for at least 2 hours, up to 3 days. Preheat the oven to 350 deg. F. Line baking sheets with parchment paper. Cut the dough logs into 1/4-inch slices with a sharp knife. Lay the slices on the parchment paper about 1 inch apart. Bake for 8 to 10 minutes, until the cookies are no longer shiny. Transfer the cookies to a wire rack and cool completely.